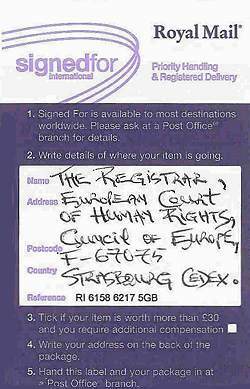 With reference to your letter to me dated July 12th 2005 please note that I am encountering delays, that are very largely beyond my control, regarding the completion of my application for the European Court of Human Rights which you have sent me. 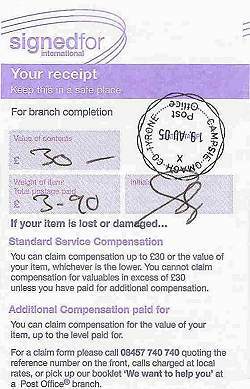 1) I am being treated for stress-related illness, which has been certified by my GP (Dr Michael Mc Cavert), and which is wholly connected with the legal problems I am writing to you about. 2) I feel I need the assistance of a suitably experienced lawyer to help me fill in the application to have my case brought before the European Court of Human Rights, and that despite my very best efforts over a period of several years, I have so far failed completely to find such help. As it is the case that I continue to believe, very strongly, that my legal rights under Article 6 (Right to a fair trial) and Article 13 (Right to an effective remedy) of the Convention for the Protection of Human Rights and Fundamental Freedoms are being violated in very major ways, and which are also proving very painful and very damaging for me incidentally, I still wish to lodge my application with the court; and, I fully intend to do so as soon as I can, and as best I can. Please note though that Mr Madden, the Senior Social Worker who is helping me, is on holiday at present and not due back at work until August 24th as far as I know. "... corruption represents a major threat to the rule of law, democracy, human rights, fairness and social justice, that it hinders economic development and endangers the stability of democratic institutions and the moral foundations of society". The above piece of text was copied from the "How was GRECO set up?" page at the COE website http://www.greco.coe.int/ .) Consequently, I am sending a copy of this e-mail to the COE "Secretariat of the Group of States against corruption".